I love the Musical Wicked and I saw this witch on another demonstrators site so I modified the punch art to fit on a standard card and made it my own. 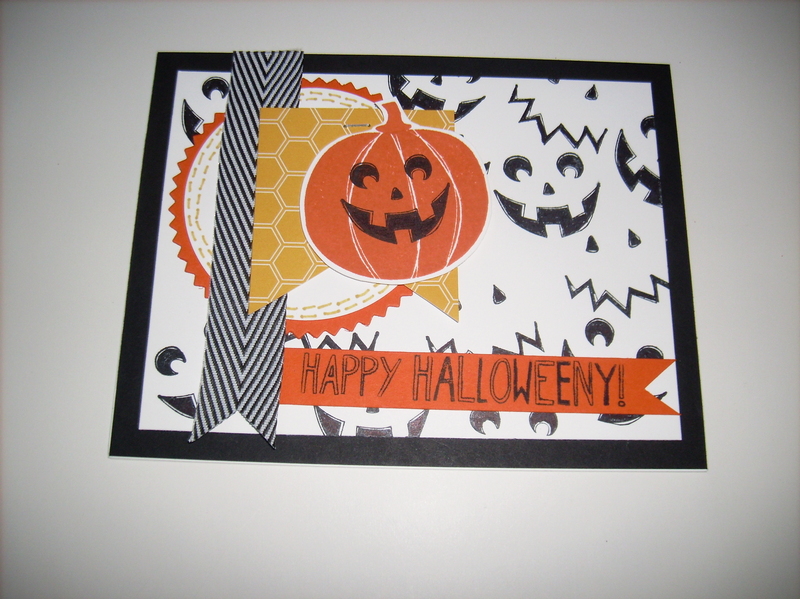 I used this as one of my Halloween card designs and was happy with the turnout and glad that I could use mostly retired Stampin Up products. Hope your Halloween is Wicked. Today’s first post just makes me smile. 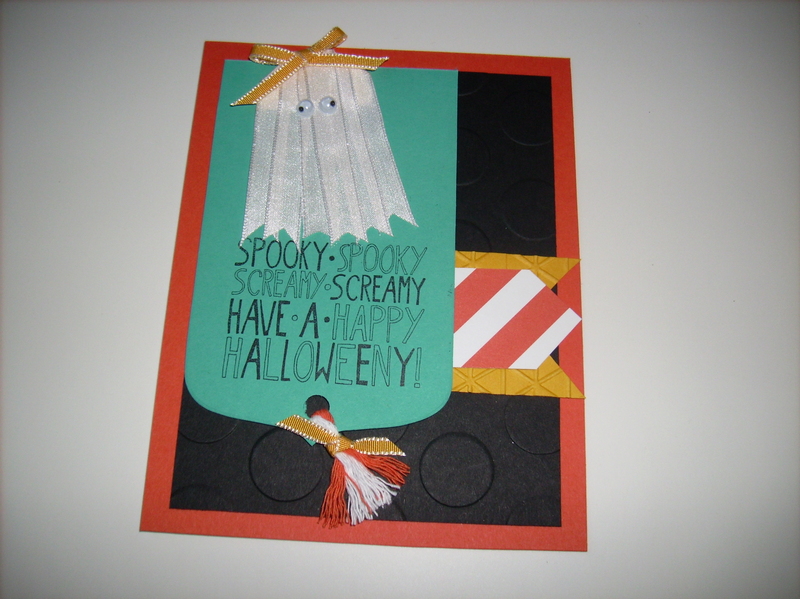 The traditional Halloween colors and the cute ribbon ghost oh my! 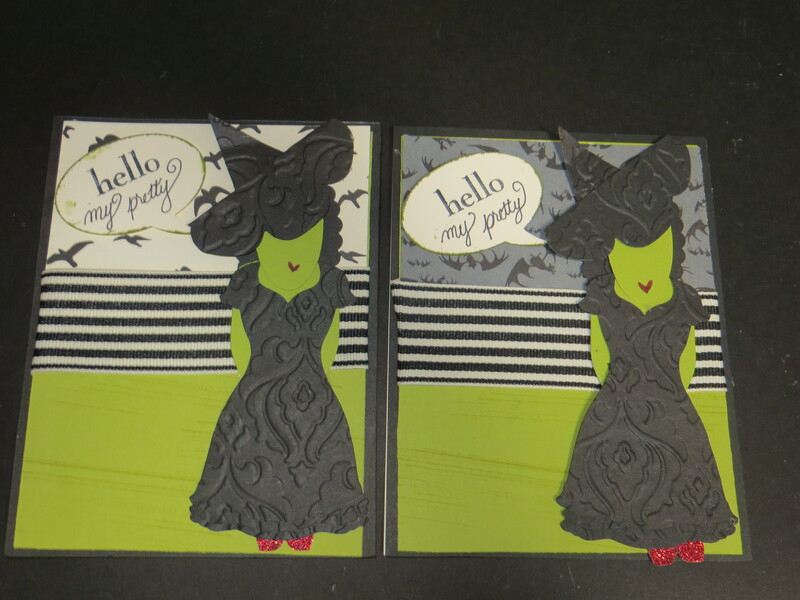 The black cardstock was textured with the Stampin Up Large Polka Dot #133739 textured impressions embossing folder. The pool party banner was cut using the Stampin Up Party Pennants die #133732. Cammie added a tassel made from the White and Tangerine Tango Two Tone Trim#135838. She added the Sentiment from the Mingle All the Way #135770 stamp set from the Stampin Up Holiday catalog. The absolutely adorable ghost was made using strips of white ribbon and then a bow added to the top using the 1/8 inch crushed curry taffeta ribbon #134585. It’s Halloweek so I will be posting multiple posts per day because we have so many cards to share. For this post Cammie was inspired by the card sample on page 46 of the Stampin Up Holiday catalog featuring the Fall Fest #135194 stamp set. Cammie did not have the Fall Fest set so she used a retired set from last year to do the job. 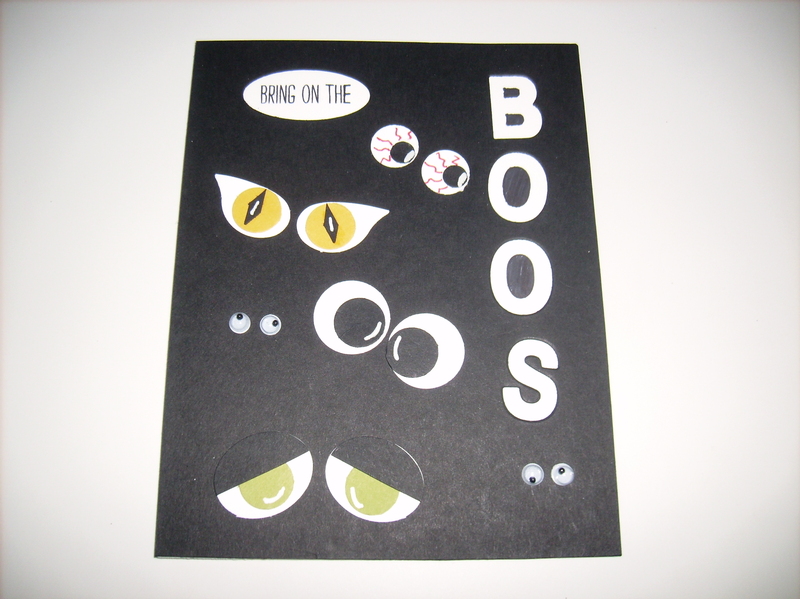 She randomly stamped the jack o lantern faces in black ink on the whisper white cardstock. She then created layers using the Starburst #132967, Circle #130911 and the Banners #132173 Framelits. 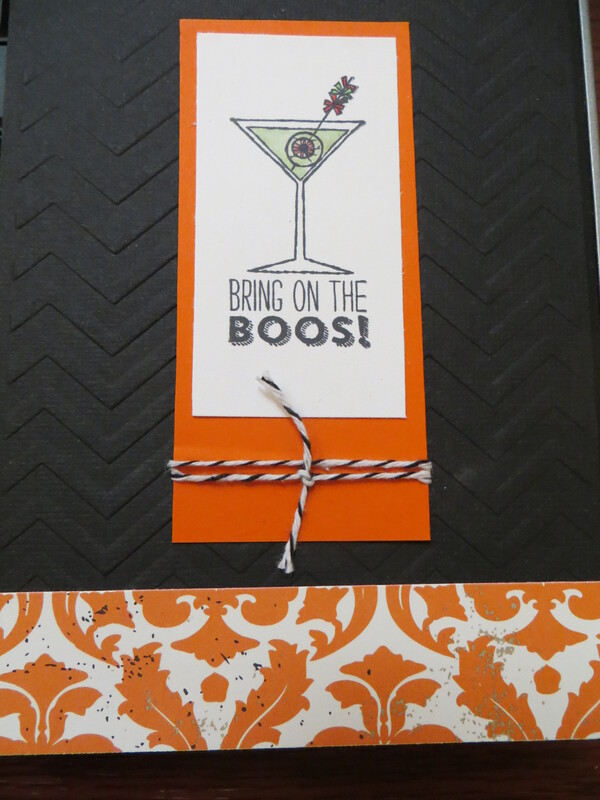 She stamped and hand cut out the pumpkin and added a piece of Black and White chevron ribbon #130010. 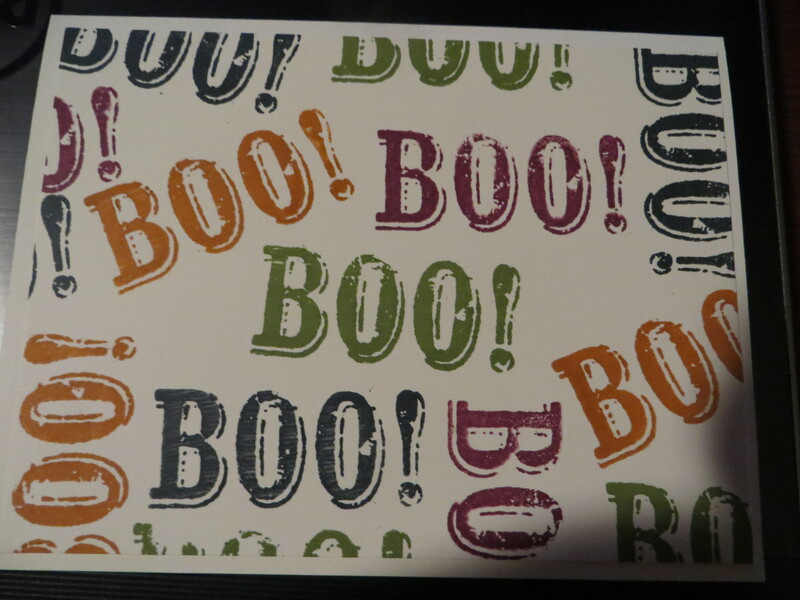 For the sentiment Cammie used a portion of the Halloween image in the Mingle All the Way #135773 and hand cut the banner to create a spooky fun card. When I received the Stampin Up holiday catalog and saw the sample on page 47, I knew I was going to order the Tee Hee Hee stamp set #135125 and use the sample as my inspiration. Today’s post is my version of the card. I used pool party ink and an aqua painter to create the sky. I then added the clothes line using a straight edge and the Stampin Up Project Life journaling pens. I stamped and hand cut out the hat, tights and dress before adding them to the clothes line with the super cute and tiny clothes pins. For the sentiment, I stamped it and then cut it out with the banners framelit #132173 and added a couple pieces of the 1/8 inch taffeta ribbon and matted it on a bigger banner. I was happy with the way it turned out and thought it was worth all the steps to complete the card. Every week Stampin Up introduces items that are on sale for 1week only. Check out the latest batch of Stampin Up deals. Discounted items for this week end on November 3, 2014. All discounted items are items that are currently in one of the Stampin Up publications: 2014-2015 Stampin Up annual catalog or the Stampin Up Holiday catalog. Today’s post is a “2-fer” post. 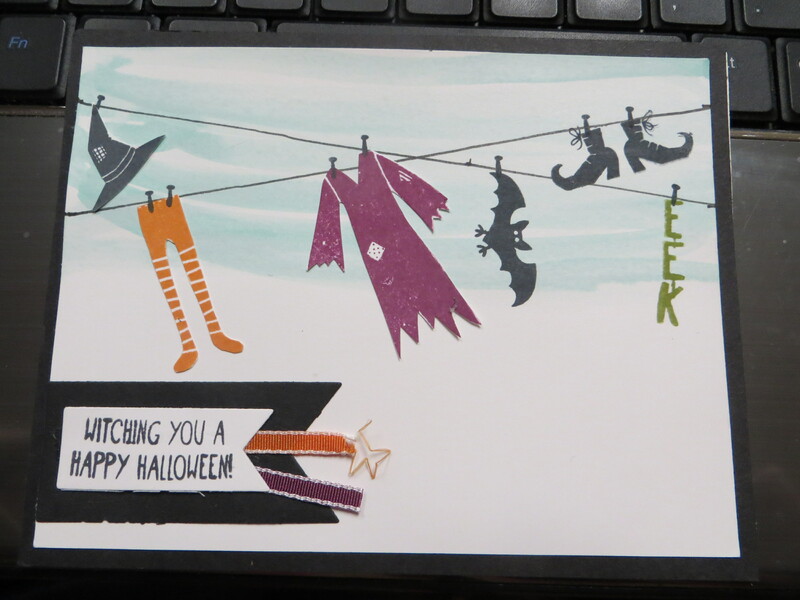 I used the Tee Hee Hee #135125 stamp set from the Stampin Up Holiday catalog. 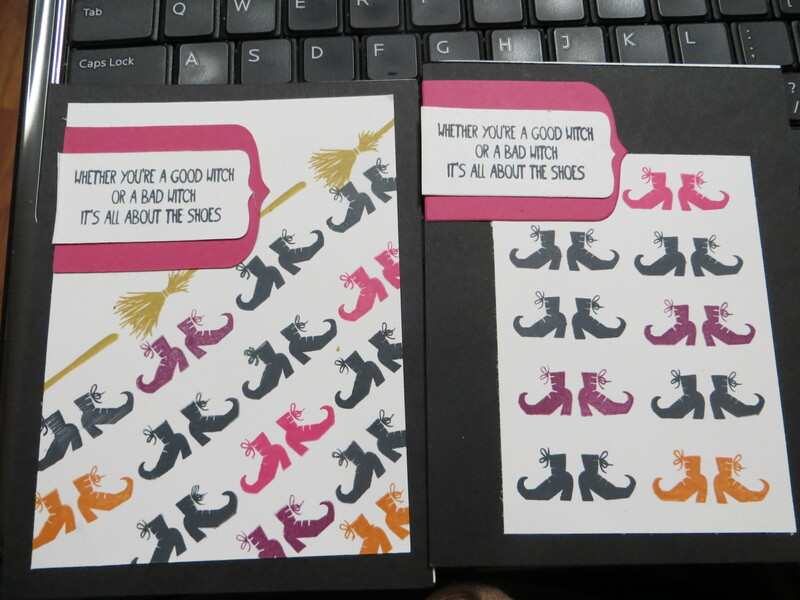 I used the same color concept and layout on both cards but added the brooms on the card on the far left. The Tee Hee Hee stamp set is a polymer set and it makes alignment super simple without a stamp- a-ma-jig or pencil lines! I added the sentiment on the Chalk Talk Framelit #129983 and matted it with the Party Pennants Die #133732.